Okay, so stick with this one for a second. Before Rep. Devin Nunes (R-Calif.) stepped away from the House Intelligence Committee’s investigation into Russian meddling in the 2016 election, the California representative took hell from Republicans and Democrats alike for bungling crucial parts of the investigation (such as running off to the White House to share info with the Trump administration before sharing it with colleagues). Perhaps most famously, Sen. Lindsey Graham (R-S.C.) compared Rep. Nunes’ stumbling and bumbling to that of Inspector Jacques Clouseau. Well, now, it looks like AG Yates will be testifying before the House Intel Committee after all. Today the committee, which is now being lead by Rep. Mike Conaway (R-Texas), announced that AG Yates would testify along with former Director of National Intelligence James Clapper and former CIA Director John Brennan on May 2 at an open hearing to discuss Russian meddling in the 2016 election and possible ties to the Trump campaign, per Raw Story. One thing that’s not clear, as of now, is whether AG Yates will be kept from discussing certain matters before the committee. 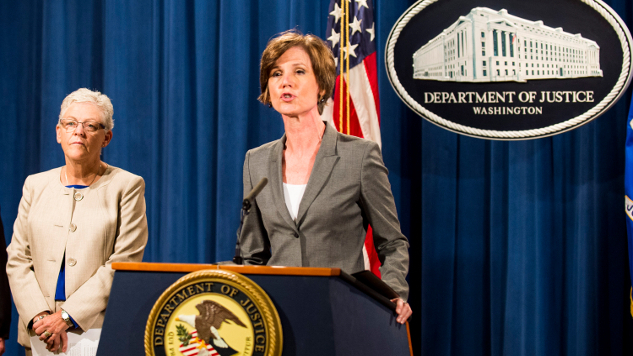 Before the initial hearing got the old heave-ho, Yates received several letters from the Department of Justice and the White House Counsel’s Office telling her that testimony containing privileged White House communications could be barred from a public hearing. Since this will be a public hearing, Yates may well have to “no comment” a bunch of questions, or defy the White House like she did back in January. Back when the hearing was first canceled, White House Press Secretary Sean Spicer said that he “looks forward” to future testimony from AG Yates, so it seems like that wish has been granted.